Born in 1928, Elliott Erwitt has been a documentarian for more than six decades, longer than any other American photographer. Starting in his twenties, his classic image of a mother and child on a bed was featured in the famous Family of Man exhibition in 1955. At the time this was considered the greatest photographic exhibition of all time with 503 pictures exhibited at the Museum of Modern Art, and curated by Edward Steichen. Erwitt has lived all over the world, speaks three languages, has photographed countless celebrities from Grace Kelly to Clark Gable as well as seven presidents. He has won every award his profession can offer, is a past president of Magnum…the finest photo agency in the world…and recently was honored with a one man exhibition by the International Center of Photography for his lifetime contribution to the medium.” This new exhibition includes over 90 images hand selected by Erwitt himself. 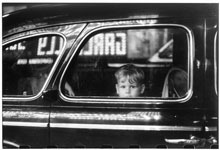 In his essay for the gallery guide, Steven Hoelscher, Departments of American Studies and Geography, Harry Ransom Center, University of Texas at Austin, writes, "This exhibition offers an enticing window into Elliott Erwitt's oeuvre. It showcases the impressive results of a remarkable career that coincides with two of the most significant developments in photography in the second half of the twentieth century: the rise of mass-circulation picture magazines; and the occasionally contentious relationship between personal work and commercial photography. 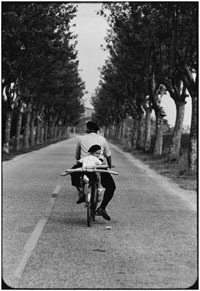 Elliott Erwitt has been a vital figure in each of these domains, as noted by his colleague, Henri Cartier-Bresson: "Elliott has, to my mind, achieved a miracle working on a chain-gang of commercial campaigns and still offering a bouquet of stolen photographs with a flavor, a smile from his deeper self." This exhibition shows both the miracle of Erwitt's balance between commercial and personal photography, and the memorable flavor that he brings to his work." The exhibition was previously exhitibed at the Boca Raton Museum of Art, FL, in 2015. The exhibition is available for scheduling through 2018. In 1948 by good fortune while looking for work on exploratory trips to New York City, Erwitt met Edward Steichen, Robert Capa and Roy Stryker who liked his photographs and took a personal guiding interest becoming significant mentors. The following year he returned to Europe traveling and photographing in Italy and France thus marking the start of his professional career. Drafted in to the US Army in 1951 he continued taking photographs for various publications totally apart from his military duties while stationed in New Jersey, Germany and France. In 1953 freshly decommissioned from military service, Erwitt was invited to join Magnum Photos as a member by its founder Capa. In 1968 he became President of the prestigious agency for 3 terms. To date he continues to be one of the leading figures in the competitive field of photography. His journalistic essays, illustrations, and advertisements have been featured in publications around the world for over half a century. 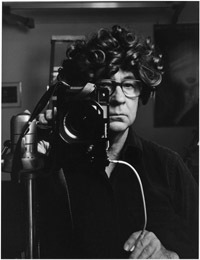 While continuing his work as a photographer, Erwitt began making films in the '70s. His documentaries include BEAUTY KNOWS NO PAIN (1971), RED WHITE AND BLUE GRASS (1973) sponsored with a grant from the American Film Institute, and the awarded THE GLASSMAKERS OF HERAT (1979). 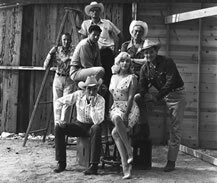 He also produced 17 comedies and special satire programs for Home Box Office in the ’80s. While actively working for magazine, industrial and advertising clients Erwitt devotes all his spare time toward creating books and exhibitions of his work. And various Asian venues too difficult to pronounce - and many others. Private galleries scattered throughout the world display, promote and sell Erwitt’s “fine art” photographs. Since the early ’50s Erwitt has settled himself in New York, establishing his fundamental base of operations …although ‘settling’ in Erwitt parlance means “where you are at the moment for as long as you don’t go somewhere else”. Flexibility and adaptation to the requirements of the profession and personal interests have kept him moving about the globe before returning to base. Few photographers have had a greater impact on American visual culture than Elliott Erwitt. Some of his best-known photographs are icons of photojournalism: Richard Nixon burying his finger in Nikita Krushchev's chest during their so-called Moscow "kitchen debate" in 1959; Jacqueline Kennedy, veiled and in distress at the funeral of her husband in 1963; the unnamed Pittsburgh boy with a pistol to his head. Likewise, his portraits of celebrities like Grace Kelley, Che Guevara, Marilyn Monroe, and Arnold Schwarzenegger have achieved notoriety, but so too have his photographs of everyday life: a couple reflected in the side mirror of a car when they are cuddling; a young mother and her newborn daughter gazing affectionately at each other, much to the approval of a nearby cat. In these and in so many of his photographs, and with a keen visual sense and finely honed wit, Elliott Erwitt illuminates the small moments of life, even when covering major news events. This is how he describes his craft: "To me, photography is an art of observation. It's about finding something interesting in an ordinary place. I've found it has little to do with the thingsyou see and everything to do with the way you see them." This insightful approach to both photography and the human condition more generally has served Erwitt well. A cosmopolitan by both necessity and profession, Elliott Erwitt has practiced his art of observation across the globe. The only child of displaced Russians, Erwitt was born in Paris, spent the first 11 years of his life in Milan, fled Europe as war approached, and, at 16, found himself living on his own in Los Angeles, where he first developed an interest in photography. 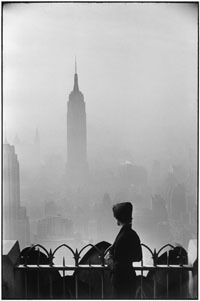 But it was in New York that Erwitt met Edward Steichen, Roy Stryker, and Robert Capa, three titans of the photography world who took an interest in the young immigrant and helped launch his career. It was Capa who, in 1953, invited him to join Magnum Photos, the distinguished agency, which elected Erwitt three times to serve as its President. In the 1970s, he expanded his work beyond photography and began making films, both documentary and comedy television. While actively working for magazines, and industrial and advertising clients, Erwitt has created books and exhibitions of his photography. To date, he has published more than 25 photography books including Photographs and Anti-Photographs (1973); Dog Dogs (1998); Museum Watching (1999); Personal Best (2010); Sequentially Yours (2011); Kolor (2013); and most recently Regarding Women (2104). 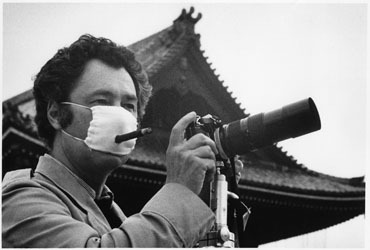 His photographs have been featured in exhibits all around the world including the Museum of Modern Art in New York, the Art Institute of Chicago, the Barbican in London, the Kyoto Museum of Contemporary Art, the International Center of Photography, where he was the 2011 recipient of the ICP's Infinity Award for Lifetime Achievement. This exhibition offers an enticing window into Elliott Erwitt's oeuvre. It showcases the impressive results of a remarkable career that coincides with two of the most significant developments in photography in the second half of the twentieth century: the rise of mass-circulation picture magazines; and the occasionally contentious relationship between personal work and commercial photography. 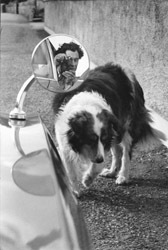 Elliott Erwitt has been a vital figure in each of these domains, as noted by his colleague, Henri Cartier-Bresson: "Elliott has, to my mind, achieved a miracle working on a chain-gang of commercial campaigns and still offering a bouquet of stolen photographs with a flavor, a smile from his deeper self." This exhibition shows both the miracle of Erwitt's balance between commercial and personal photography, and the memorable flavor that he brings to his work. The smile that Cartier-Bresson describes stems from Erwitt's life-long project to observe, and then comment on, the human comedy. One of the great masters of humor and irony in photography, Erwitt consistently and poetically captures life's comic parade. For this beloved image- maker, the human comedy is not always funny, but sometimes marked by fear- based hatreds, loneliness, and banality. Elliott Erwitt's art of observation-itself imbued with irony and a tendency toward off-kilter juxtaposition-surveys the human comedy in its endless variety. What emerges from his camera is a complicated world where the ordinary and absurd reside side-by-side. He may be most well known for his offbeat humor, but that's only part of what makes his photographic art so original. Equally important is a highly developed visual sensibility. This photographer's art of observation reaches its full potential when it captures a memorable moment, or, as Erwitt himself describes it, "a synthesis of a situation, an instant when it all comes together." Regardless of whether the photograph came from his work in photojournalism, as part of an advertising campaign, or as a personal "snap," each memorable picture presents a moment worth pondering. For Erwitt, that moment is decisive if the formal elements of the picture come together to create an original and highly personal comment about the subject. 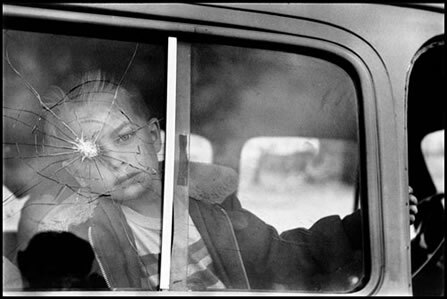 Look at the young boy peering out of the Colorado car in 1955 with the shattered window bullet hole located directly before this right eye. It's a haunting picture and it's up to each of us viewers to decide what that comment is; Erwitt won't tell us. But that's exactly what makes looking at photographs so rewarding.